Family: Wife Patricia and five children. The Cook County Sheriff is the chief law enforcement officer in the county and is responsible for providing services and securing to all county court facilities, administering the Cook County Jail, and policing the unincorporated areas of Cook County. As Cook County Sheriff, I have brought an innovative approach to law enforcement which resulted in me being named one of Governing Magazine’s Public Officials of the Year for 2017. As a former prosecutor and state legislator, I have long fought to protect the most vulnerable members of our society. Since becoming Sheriff in 2006, I have introduced sweeping changes at the Cook County Jail, aggressively re-structured the Sheriff’s Police force to address gun violence in city and the scourge of human trafficking, improved operations of eviction process to insure thoughtful treatment of tenants and landlords. 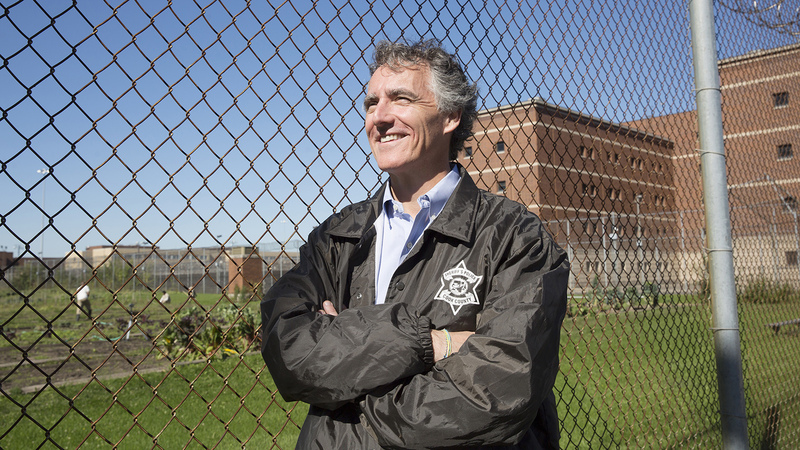 From addressing concerns surrounding general overcrowding and a growing mental health population, to developing environmentally sustainable initiatives for inmates, the Sheriff’s Office has won praise for progressive reforms to improve and maintain the safety and security of all those housed and employed at the Cook County Jail. In 2013, we launched the Office of Mental Health Policy & Advocacy, which operates a 24-hour Care Line for mentally ill ex-inmates and families of current mentally ill inmates, while screening all pre-bond detainees for mental illness. This effort has become a national model for treatment of mentally ill in jail. We have received many awards from national and local mental health advocacy organizations for our push to end what has become a de facto criminalization of mental illness. Workforce initiative (RENEW). RENEW trains inmates in deconstruction techniques using curriculum developed by the Building Materials Reuse Association. Participants also receive an OSHA 10 work site safety certification. Participants work on crews deconstructing abandoned and vacant houses that plague distressed communities across the county – communities that can’t afford to demolish the homes without such help. Through this, inmates give back to the community and develop skills that are marketable to employers while neighborhoods see improved property values and reduced crime. Additionally, the Sheriff’s Office began the expansion of its jail garden, the harvest of honey from on-site bee hives. These projects offer inmates the opportunity to gain valuable and marketable skills that can be utilized upon release, with the produce bringing in revenue and turning a profit for county taxpayers. These efforts resulted in the Sheriff’s Office recently being released from a more than 40 year-old federal consent decree on the operations of Cook County Jail and a positive profile of the jail that aired on 60 Minutes earlier this year. Fixing our indifferent criminal justice system. To address this issue, I will continue to work towards improving three key aspects of this system: defendant length of stay, unreasonable warrants, and the scourge of human trafficking. Length of stay. It takes far too long for defendants to reach their final case disposition in Cook County. As of January 12, 2018, there were eighty-five pretrial defendants still in custody after five years, sixteen over seven years, and three over nine years. There is significant work that needs to be done to make this process more efficient. Shortening defendant’s length of stay is not only morally responsible but it will also result in vast savings for Cook County taxpayers. Unreasonable warrants. Currently there are over 40,000 outstanding warrants in cook county. Over 50% are a decade old or more. The majority of these warrants are not related to violent crimes or crimes against people – contrary to what would be expected in situations where a charge is handed down and a defendant is not already in custody. In all, more 50% of these warrants are related to drug and property charges. Law enforcement’s limited resources should not be wasted in gathering decades old warrants which stem from non-violent offenses. Continue to combat human trafficking. My office will continue to respond to areas where we know prostitution occurs (on the street or internet). We will continue to talk with these women about getting out of the business and try to get those we talk with to cooperate with us to find out if there are bigger players involved.